Run for cover! A torpedo! This thing is above our house. Oh... mom said its the Zepplin. Whatever that is. For the first time in nearly 100 years, a Zeppelin is coming to Southern California. Pee S. Mango da Man!! White round thing... sorta like you Benny! Congrats again for your Mango's Choice award, that is a most distinguished honor! 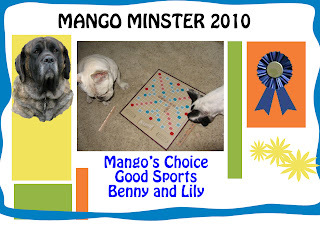 Congratulations on your great Mango Minster Award! That was a strange thing to see in the sky. We can see the story bored you......well 100 years is a bit before you were born. Watch that thingy!!! I think it just may be full of ..... SQUIRRELS!!! Wooos Congrats on your Mango award!!! Woo Woo! We have those zeppelin things over here all of the time, they bore me too! Very cool Zeplin! Love your Mango Award. That thing does look a little scary!!! Awesome award, Candy just loves her certificate! Congrats on your award from Mango! Your mom better frame it and hang it in the front room for everyone to see. That thing looks like a giant bird turd! RUN FOR COVER! urgent prayer request on arise 2 write. I've heard of Led Zepplin.... but I don't think they flew. Oh. Wait. Stormy said they did.... but apparently that's another story. Congrats on your cool award from Mango Minster! We think that torpedo looks pretty scary too, guys! Congratulations on your MangoMinster certificate! A zepplin? Can I eat it? Can I play with it? No? Yep sounds pretty boring to me too, then!! A good nap is good for everyone. That must have been a big surprise to wake up to. Did it cover up your sun? Khongrats on your Mango Minster 2010 achievement! That is some Zeppelin guys, thanks for all the info and congrats on your Mango award!!! Wow! Moose is right, that does kind of look like you. We see those sometimes here. I will check next time for chicken legs. Maybe they are giant floating frenchies. We wouldn't be interested either unless it was dropping treats or something! I guess my mom would love to see it too! We'd love to bark at that Zeppelin. That must have been quite a sight, love the heart on it!